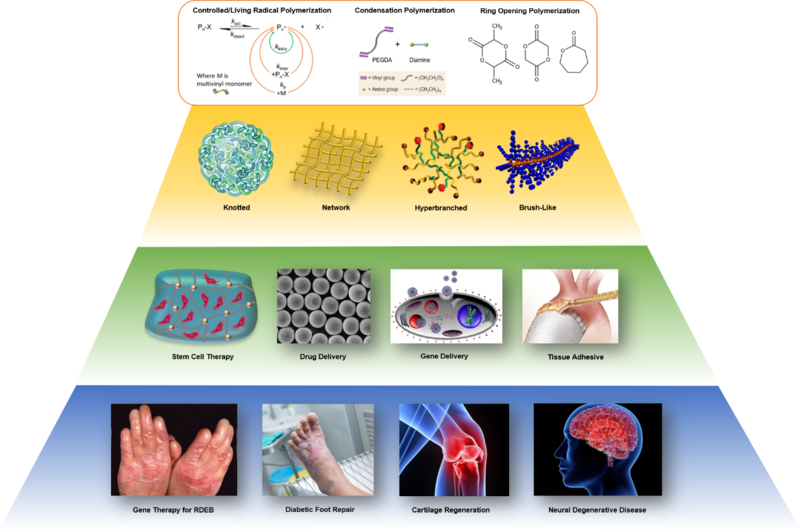 The research interests in our group are mainly focused on: 1) mechanistic understanding of reversible deactivation radical polymerization (RDRP); 2) kinetically controlled (co)polymerization of multivinyl monomers (MVMs); 3) structural manupulation and biomedical application of knotted/cyclized and branched polymers in skin wound healing and tissue regeneration. Our clinical targets are gene therapy of recessive dystrophic epidermolysis bullosa (RDEB), diabetic foot repair, cartilage regeneration and neural degenerative diseases. The evolution of RDRP paved the way toward the controlled (co)polymerization of MVMs. The RDRP of monovinyl monomers and small amounts of MVMs via nitroxide-controlled free radical polymerization (NMP), atom transfer radical polymerization (ATRP) and reversible addition fragmentation chain transfer (RAFT) polymerization have been utilized to synthesize soluble polymers with branched or star structures. Compared to the copolymerization of monovinyl monomers and MVMs, the controlled homopolymerization of MVMs is especially challenging or even ‘impossible’, since each MVM is a potential crosslinker. Unsurprisingly, most of the results show that gelation occurred at very low monomer conversions (< 10%), as predicted by P. Flory and W. Stockmayer 70 years ago. Soluble polymers described in some experiments are attributed to highly diluted reaction conditions or the addition of a special template. In 2007, Prof. Wang proposed a completely new concept - deactivation enhanced ATRP (DE-ATRP), which breaks through two barriers for the polymerization of MVMs: uncontrollable homopolymerization and highly diluted reaction conditions, leading to successfully controlled homopolymerization of MVMs in concentrated conditions. This new synthetic approach is realized by precisely controlling the competition between chain growth and reversible chain termination, polymers can grow slowly and effectively while branching is introduced by the MVMs in a controlled fashion, and thus crosslinking reaction is delayed (Figure 1). This kinetically controlled RDRP concept has been demonstrated by the successful homopolymerization of MVMs, e.g. ethylene glycol dimethacrylate (EGDMA), with good control over the molecular weight and chain structure (1). It allows the use of readily available MVMs as branching agent for the synthesis of new dendritic polymers. Since then, we have been continually working on the development of this new approach for the design and preparation of multifunctional polymeric materials for various applications. In 2011, we utilized the kinetically controlled strategy - in situ DE- ATRP for homopolymerization of MVMs. Remarkably, a new 3D single-chain cyclized/knotted polymer (SCKP) structure, distinct from conventional dendritic/hyperbranched and crosslinked materials, was generated due to the enhanced intramolecular cyclization and suppressed intermolecular crosslinking (Figure 2) (2). Subsequently, in 2013, we reported a ‘Vinyl Oligomer Combination’ strategy, in which alteration of the growth manner of polymerization by controlling the kinetic chain length, together with the manipulation of chain growth conditions achieves veritable hyperbranched materials possessing nearly 70% branch ratios as well as multiple vinyl functional groups (3). This approach allows for facile synthesis of highly branched polymeric materials from readily available MVMs, which have long been considered as formidable starting materials in addition polymerization. Recently, we extended this kinetically controlled strategy to Cu0-mediated RDRP systems. We demonstrate that the homopolymerization of acrylate based MVMs can be kinetically controlled via Cu0-mediated RDRP in the presence of additional CuII, in which the gelation can be effectively delayed over ca. 40% monomer conversion in concentrated polymerization system ([M] = 40.9 wt %). Moreover, closer inspection of the synthesized polymers reveals that SCKP nanoparticles are formed due to the nature of one-pot in situ intramolecular reaction and self-cyclization of the propagating polymer chains (4). The kinetic control strategy has also been successfully applied to the copolymerization system of MVM and monovinyl monomer (5-7), which greatly expands the functionality of obtained polymers and their applications. 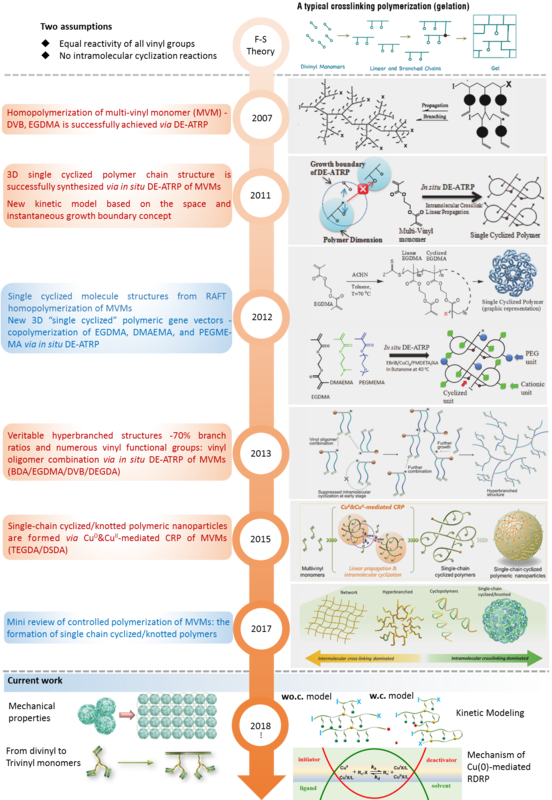 In 2017, in collaboration with Prof. Krzysztof Matyjaszewski, the world-known scientist in the field of polymer science, we published a review paper to summarize the major contributions of our group on controlled (co)polymerization of MVMs toward the formation of SCKPs (Figure 3) (8). Through the manipulation of intermolecular crosslinking and intramolecular cyclization using the kinetically controlled approach, we can design two clearly different polymer structures, including the veritable hyperbranched polymer structure with a high branching ratio and the SCKP structure. It can be foreseen that this new strategy could open up the field to the polymerization of a very wide range of MVMs or combinations of comonomers, and thus diverse new polymers with novel properties will be obtained. 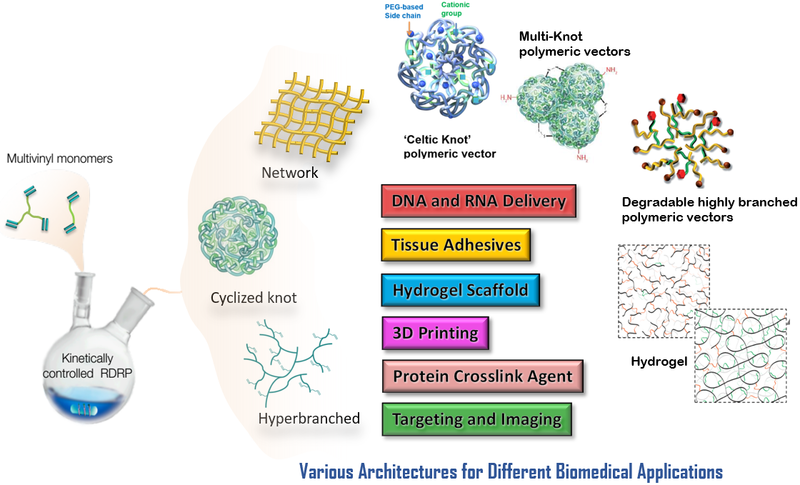 Utilization of the kinetically controlled (co)polymerization of MVMs, our group has synthesized a series of SCKPs and branched polymers and used them as gene delivery vectors, injectable tissue engineering hydrogel scaffolds and tissue adhesives etc. (Figure 4).
. Wang, W.; Zheng, Y.; Roberts, E.; Duxbury, C. J.; Ding, L.; Irvine, D. J.; Howdle, S. M. ‘Controlling chain growth: a new strategy to hyperbranched materials’ MACROMOLECULES 2007, 40(20), 7184-7194.
. Zheng, Y.; Cao, H.; Newland, B.; Dong, Y.; Pandit, A.; Wang, W. ‘3D Single Cyclized Polymer Chain Structure from Controlled Polymerization of Multi-Vinyl Monomers: Beyond Flory-Stockmayer Theory’ JOURNAL OF AMERICAN CHEMICAL SOCIETY, 2011, 133(33), 13130-13137.
. Zhao, T.; Zheng, Y.; Poly, J.; Wang, W. ‘Controlled multi-vinyl monomer homopolymerization through vinyl oligomer combination as a universal approach to hyperbranched architectures’ NATURE COMMUNICATIONS, 2013, 4(5), 1873.
. Gao, Y.; Zhou, D.; Zhao, T.; Wei, X.; Mcmahon, S.; Ahern, J. O.; Wang, W.; Greiser, U.; Rodriguez, B. J.; Wang, W. ‘Intramolecular cyclization dominating homopolymerization of multivinyl monomers toward single-chain cyclized/knotted polymeric nanoparticles’ MACROMOLECULES, 2015, 48(19), 6882-6889.
. Newland, B.; Zheng, Y.; Jin Y.; Aburub, M.; Cao, H.; Wang, W.; Pandit, A. ‘Single cyclized molecule versus single branched molecule: a simple and efficient 3D "knot" polymer structure for nonviral gene delivery’ JOURNAL OF AMERICAN CHEMICAL SOCIETY, 2012, 134(10), 4782-4789.
. Zhao, T.; Zhang, H.; Newland, B.; Aied, A.; Zhou, D.; Wang, W. ‘Significance of branching for transfection: synthesis of highly branched degradable functional poly(dimethylaminoethyl methacrylate) by vinyl oligomer combination’ ANGEWANDTE CHEMIE, 2014, 53(24), 6095-6100.
. Newland, B.; Aied, A.; Pinoncely, A. V.; Zheng, Y.; Zhao, T.; Zhang, H.; Niemeier, R.; Dowd, E.; Pandit, A.; Wang, W. ‘Untying a nanoscale knotted polymer structure to linear chains for efficient gene delivery in vitro and to the brain’ NANOSCALE, 2014, 6(13), 7526-7533.
. Gao, Y.; Newland, B.; Zhou, D.; Matyjaszewski, K.; Wang, W. ‘Controlled polymerization of multivinyl monomers: formation of cyclized/knotted single-chain polymer architectures’ ANGEWANDTE CHEMIE, 2017, 56(2), 450-460. Gene therapy offers the prospect of treatment for various inherited and/or acquired diseases. Nonetheless, the translation of gene therapy treatments to clinical applications has been severely hampered because of insertional mutagenesis of virus-based systems and shortcomings in efficiency observed in nonvirus-based systems, which continues to drive the development of advanced gene delivery vectors. The large research effort focused on enhancing non-viral transfection vectors has clearly demonstrated that their macromolecular structure has a significant effect on their transfection efficacy. 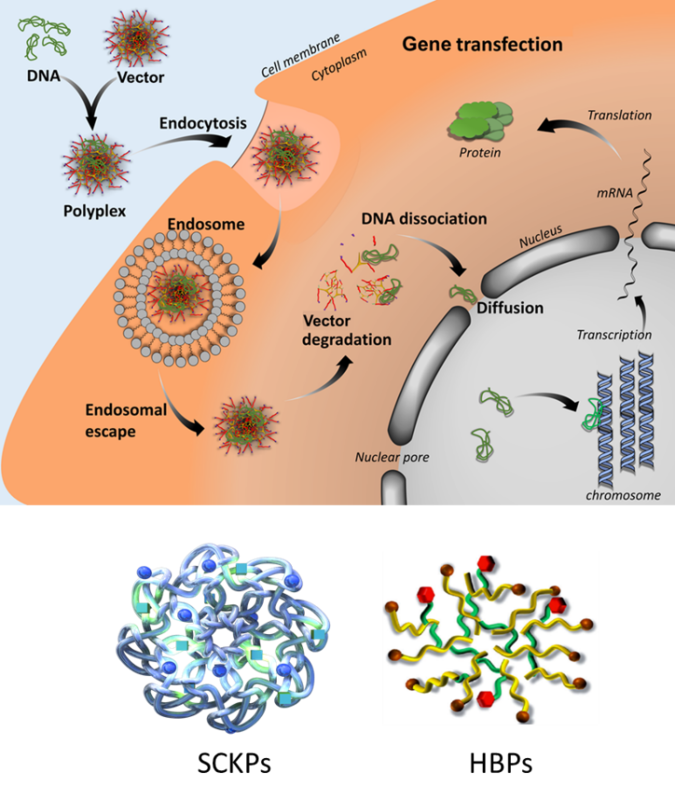 The 3D branched polymeric structures, such as dendrimers, have proved to be a very effective structure for polymeric transfection vectors; however, so far the dendritic polymers have not delivered on their promise. This is largely because a wide range of dendritic polymer materials with tailored multifunctional properties and biocompatibility required for such applications are not yet accessible by current routes. In 2012, using the DE-ATRP approach, we pioneered the design and synthesis of poly(2-(dimethylaminoethyl) methacrylate) (PDMAEMA) SCKPs with well-defined compositions and functionalities as non-viral gene delivery vectors from readily available vinyl monomers. It was found that the PDMAEMA SCKPs interact differently with plasmid DNA compared to commercially available gene transfection reagent poly(amidoamine) dendrimer (PAMAM). Over a range of cell types, the PDMAEMA SCKPs exhibits a superior transfection performance (Figure 1) (1). In following study, by combining ring-opening addition polymerization and intramolecular cyclization into an on-pot RAFT copolymerization, main chain degradable PDMAEMA SCKPs were synthesized. In different from previous SCKPs counterparts whose backbones are entirely carbon-carbon bonds, part of the backbone of the newly developed PDMAEMA SCKPs are disulfide bonds and can be cleaved by reduction leading the degradation of the polymers, and thus exhibiting high transfection efficiency and much lower cytotoxicity (2). Further, in 2014, using bis(2-acryloyl)oxyethyl disulfide (BADS) as the branching monomer, we developed degradable highly branched PDMAEMA polymers (HBPs) for gene delivery through the “Vinyl Oligomer Combination” strategy. It is shown that the degree of branching has a big impact on the performance of PDMAEMA in transfection. Branched PDMAEMA with the highest degree of branching and highest degree had a superior transfection profile in terms of both transfection capability and the preservation of cell viability (3). Another type of non-viral gene delivery vectors our group has been developing is highly branched poly(β-amino ester)s (HPAEs). Poly(β-amino ester)s were first developed in 2000 by Lynn and Langer at MIT. Relying on high-throughput synthesis and evaluation systems, more than 2500 linear structured poly(β-amino ester)s (LPAEs) were designed, synthesized and screened for gene transfection by Green and Anderson et al. Of these, the best-performing LPAEs were identified for both in vitro and in vivo gene delivery, which can even rival adenovirus on human umbilical vein endothelial cells. However, until 2015, all design, synthesis, and transfection studies with poly(β-amino ester)s had been focused on their linear structure. Although the results from LPAEs are very encouraging, the potential for synthesizing and optimizing structures with multiple functional groups is limited by the linear nature of these polymers. In contrast, HPAEs have a 3D architecture with multiple functional terminal groups would be more appealing for gene transfection. To address this challenge, our group developed HPAEs via a new one-pot “A2 + B3 + C2” Michael addition approach (4). The HPAEs are essentially derived from the same sets of monomers as the LPAEs that have already been proven to be efficient in gene delivery. Meanwhile, substantially new benefits could be obtained through the introduction of branched structures and thus give rise to much higher transfection efficiency compared to the original LPAEs, from which the HPAEs were modelled. To demonstrate the broad applicability of the “A2 + B3 + C2” synthesis strategy, we synthesized 12 BPAEs using 12 different sets of commercial monomers. Notably, six of them were previously used for the synthesis of the best-performing LPAEs. Gene transfection studies in 12 different cell types ranging from cell lines, primary cells, to stem cells show that the branched structure can significantly enhance the transfection efficiency of poly(β-amino ester)s: Up to an 8521-fold enhancement in transfection efficiency was observed across the 12 cell types over their corresponding LPAEs and the commercial transfection reagents polyethyleneimine, SuperFect, and Lipofectamine 2000 (Figure 2) (5). The high-performance HPAEs were further used for gene therapy of RDEB. RDEB is defined by severe chronic skin fragility due to mutations in COL7A1, which fully prevent protein production, effect mRNA stability or lead to a truncated form of C7 damage the integrity of the dermal/epidermal anchoring fibrils, phenotypically presenting as a fragile epidermis. From birth, the loss of attachment causes the tissues to shear apart from the underlying dermis when pressure is applied, giving the new-borns the name “Butterfly babies”. Even very slight mechanical stress causes the skin to shear at the BMZ and produces the blisters indicative of the RDEB condition (Figure 3). The slow healing of these blisters results in the long-term conditions, scarring, contracture and loss of movement. The most severe subtype of RDEB is the ‘severe generalized’ form of RDEB (RDEB-sev gen), which is caused by bi-allelic premature stop mutations in COL7A1. There are roughly 25000 people worldwide with RDEB. The phenotype of RDEB leaves a weakened biological system, constantly expending large amounts of energy to heal and replenish itself. Patients with RDEB-sev gen have a high risk of developing metastatic squamous cell carcinoma (SCC) by their third decade. This culminates to a 70% risk of mortality due to SCC by the 45th year. It is hypothesized that the lack of C7 is in itself a factor in the patients with RDEB high incidence of SCC, which further highlights the urgent need to develop a causative therapy. 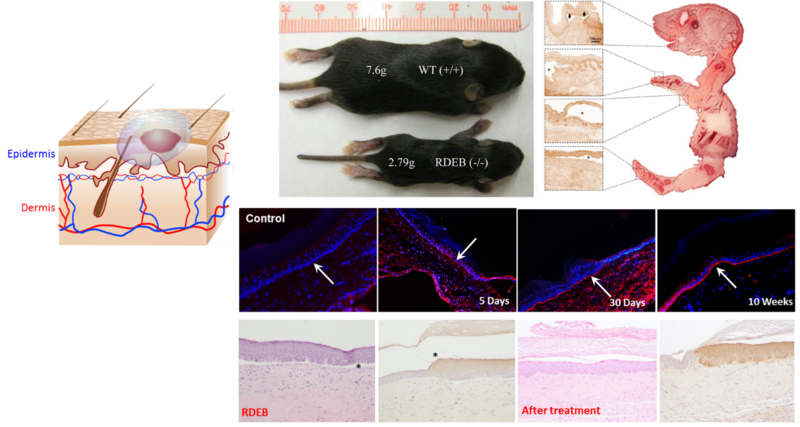 C7 being essential to the strength of the skin is also highly important for migration of keratinocytes to close wounds, and so, its absence is both the cause of and impediment to the healing of RDEB patients. Unfortunately, currently there is no effective cure for RDEB, all existing treatments are palliative, and restoration of the tissue alone is not enough to heal RDEB patients. The figure varies from patient to patient but their treatment costs can be over €100,000 per year. To test the feasibility of HPAEs for gene therapy of RDEB, a RDEB knockout mouse model and a RDEB graft mouse model were constructed. HPAE/COL7A1 polyplexes were injected into or topically applied on the RDEB wounds. Significant levels of recombinant C7 expression were detected, even after 10 weeks (Figure 3) (6,7). Moreover, the remaining recombinant protein was still at a significant level. Meanwhile, no obvious toxicity was observed. The promising in vitro and in vivo results not only demonstrate that branching can significantly enhance the gene transfection efficiency of poly(β-amino ester)s but also reveal the potential of HPAEs in clinical applications.
. Gao, Y.; Bohmer, V.I. ; Zhou, D.; Wang, W.; Paulusse, J.M.J. ‘Main-chain degradable single-chain cyclized polymers as gene delivery vectors’ JOURNAL OF CONTROLLED RELEASE, 2016, 244, 375-383.
. Cutlar, L.; Zhou, D.; Gao, Y.; Zhao, T.; Greiser, U.; Wang, W.; Wang, W. ‘Highly branched poly(β-amino ester): Synthesis and application in gene delivery’ BIOMACROMOLECULES, 2015, 16, 2609-2617.
. Zhou, D.; Cutlar, L.; Gao, Y.; Wang, W.; O’Keeffe-Ahern, J.; McMahon, S.; Duarte, B.; Larcher F.; Rodriguez, B.J. ; Greiser, U.; Wang, W. ‘The transition from linear to highly branched poly(β-amino ester)s: Branching matters for gene delivery’ SCIENCE ADVANCES, 2016, 2, e1600102.
. Zhou, D.; Gao, Y.; Aied, A.; Cutlar, L.; Igoucheva, O.; Newland, B.; Alexeeve, V.; Greiser, U.; Uitto, J.; Wang, W. ‘Highly branched poly(β-amino ester)s for skin gene therapy’ JOURNAL OF CONTROLLED RELEASE, 2016, 244, 336-346.
. Cutlar, L.; Zhou, D.; Hu, X.; Duarte, B.; Greiser, U.; Larcher F.; Wang, W. ‘A non-viral gene therapy for treatment of recessive dystrophic epidermolysis bullosa’ EXPERIMENTAL DERMATOLOGY, 2016, 25, 818-820. Stem/progenitor cells have shown substantial promise in tissue engineering and regenerative medicine due to their capacities to self-renew and differentiate into specific cell types. However, limited retention and survival of transplanted stem cells remain challenges for traditional cell delivery approaches. To this end, injectable hydrogels have been applied and extensively explored to fulfil the requirements of cell therapies, including improving cell engraftment and viability, directing cell fate and function, and providing proper mechanical supports. Extracellular matrix (ECM) components with proper mechanical and biochemical properties can preserve stem cell function, enhance survival of transplanted cells and guide tissue regeneration. Although they have been regarded as ideal materials to fabricate injectable hydrogels, several major drawbacks significantly limit their clinical translation as cell delivery systems, such as uncontrollable degradation, undesired gelation profiles and poor mechanical properties. 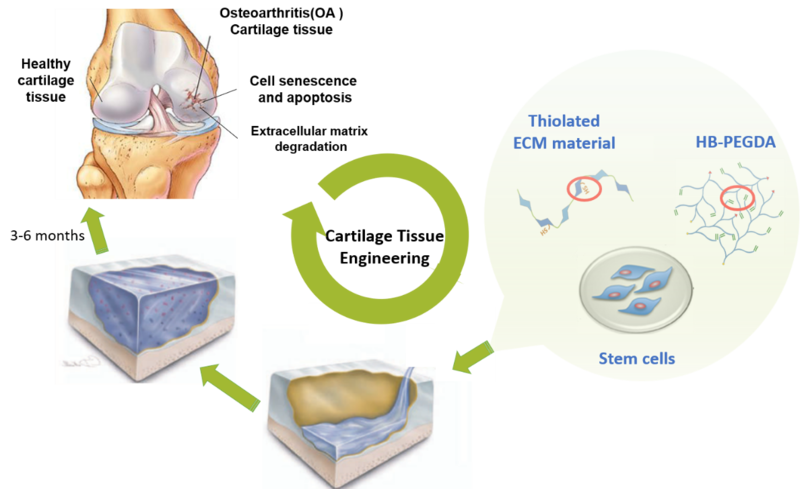 In contrast, hybrid hydrogel systems generated by the combination of synthetic and natural ECM biopolymers are superior for tissue engineering and wound healing. Utilization of kinetically controlled RDRP of MVMs and Michael addition reaction, we have synthesized a series of cyclized/knotted and branched polymers with multiple pendent vinyl groups. Meanwhile, a variety of ECM components (e.g., hyaluronic acid (HA), chondroitin sulfate (CS), gelatin, etc.) are modified with functional groups (e.g., thiol and amine groups). 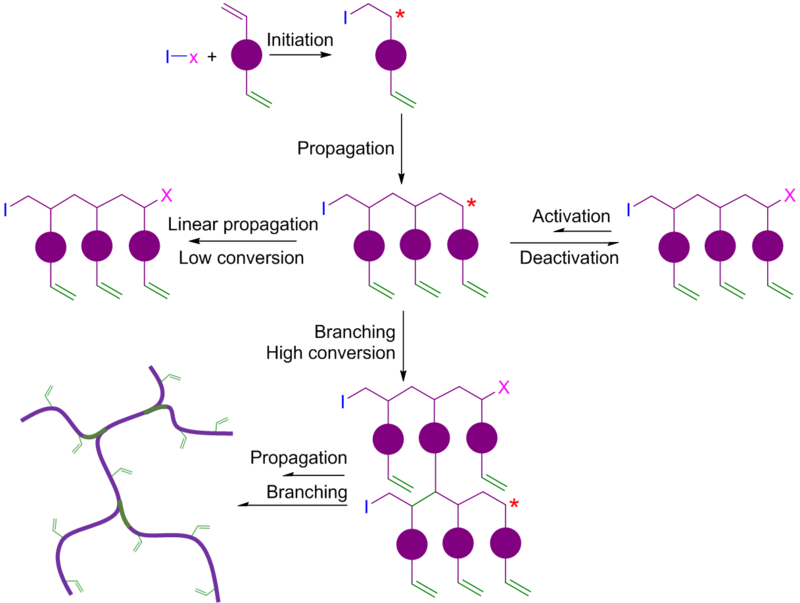 The cyclized/knotted or branched polymers and modified ECM can crosslink in situ to form hybrid hydrogels with improved characters such as rapid gelation capability, highly tunable mechanical property, controlled biodegradability, desired biocompatibility and enhanced retention and survival of stem cells (Figure 1) (1–4). Besides, the injectable hybrid hydrogels can be molded into any desired shape to match the irregular defects with minimal invasion. 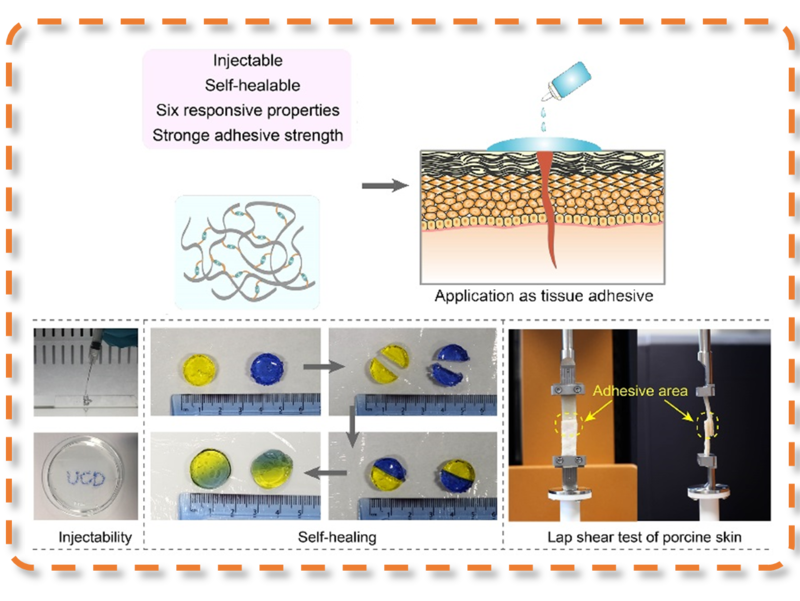 Therefore, the advanced injectable hybrid hydrogels could be excellent stem/progenitor cell delivery systems and hold great potential for tissue regeneration and wound healing applications. A diabetic foot ulcer is an open sore or wound with disintegration of the surrounding tissue. They most commonly occur on the bottom of the foot and can affect anyone with diabetes. Ulcers occur due to multiple physical and physiological factors, such as lack of feeling in the foot (neuropathy), restricted circulation, deformities, friction or pressure, and trauma, as well as being an indication of mismanaged diabetes. There are 30.3 million people of all ages in the United States or 9.4% of the population who have diabetes (2017 National Diabetes Fact Sheet). The prevalence in EU is estimated to be 5%. 15% of Diabetic foot ulcer cases lead to amputation and so are the cause of 85% of all amputations. The lifetime incidence of foot ulcers is estimated to be between 19% to 34% of diabetes population. Many diabetes patients develop ulcers because of an acute of chronic repeated trauma and a combination of the following conditions: i) Neuropathy, a reduced or complete lack of feeling in the feet due to nerve damage caused by elevated blood glucose levels over time; ii) Vascular disease which reduces the body’s ability to heal and prevents the access of antibiotics, increasing the risk of infection; iii) Elevations in blood glucose can also reduce the body’s ability to fight off a potential infection and also retard and progress to gangrene. If the infection spreads to the blood stream it can become life threatening. As diabetic foot ulcers have such a range of etiological factors there is a high level of variation seen in these wounds. Current therapeutic technologies for diabetic foot ulcers includes closely monitored glycemic control, aggressive regular debridement, antibiotics, moist wound dressings, skin substitute, pressure offloading, and surgeries. However, these treatments are usually associated with a very high possibility of recurrence and amputations. Therefore, a pressing need for efficacious and low-cost treatments in diabetic wounds exists. Our research efforts in this filed are targeted at developing in situ crosslinking hybrid hydrogel scaffolds which can easily encapsulate ADSCs, support their proliferation and lead to enhanced secretion of growth factors and cytokines for the healing of chronic wounds (Figure 2). Our strategy is to develop multifunctional cyclized/knotted and branched polymers which can form hydrogels in situ with modified ECM biomolecules such as hyaluronic acid, gelatin or collagen. Relying on the versatile kinetically controlled RDRP of MVMs and Michael addition platforms, we have synthesized a series of multifunctional cyclized/knotted and branched polymers, which can form hydrogels in situ on wounds to provide a biomimetic niche for ADSCs, and thus functions as a dressing or skin substitute as well as a reservoir system to improve stem cell retention and secrete essential growth factors and cytokines to accelerate wound healing in chronic diabetic ulcers. Given the differences between wound healing phases individually, the properties of the hydrogels such as degradability, redox state etc. can be manipulated flexibly in a facile manner through the introduction of functional components into the polymers. For example, by selecting diamines with varying spacer lengths for hyperbranched polymer synthesis, hydrogels with on-demand degradation profiles can be prepared to match different types of wound healing processes (Figure 3). 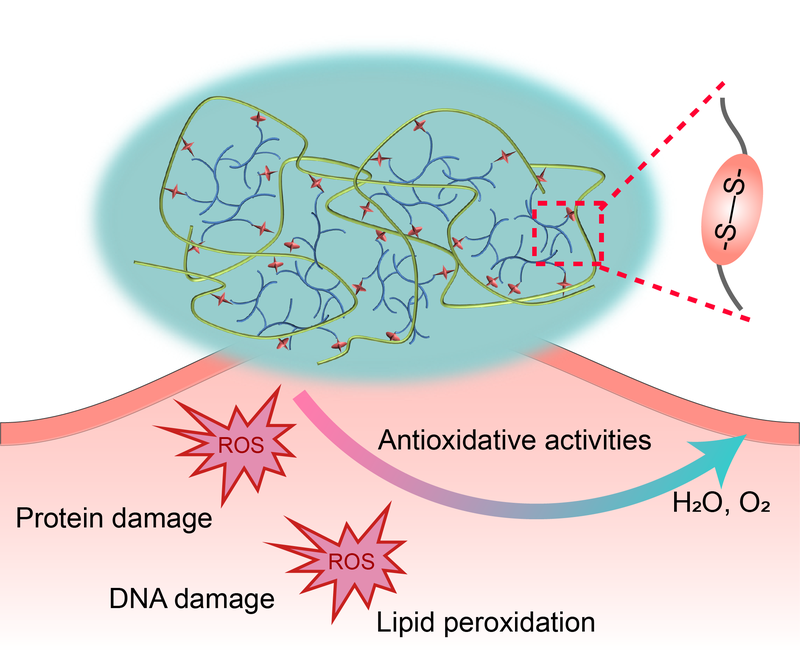 By introducing disulfide moieties into the branched polymers, reactive oxygen species (ROS) hydrogels can be prepared which is capable of modifying wound environment, such as reducing inflammation, decreasing ROS concentration, etc. (Figure 4). Figure 3. 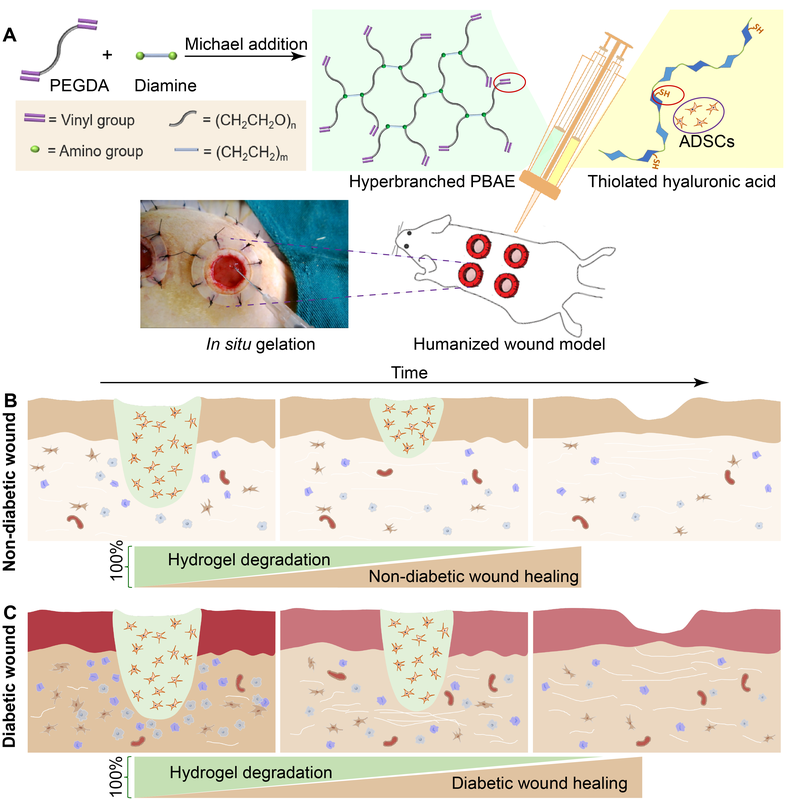 Fast and slow-degrading hydrogels as skin substitutes targeting different wound types. Figure 4. 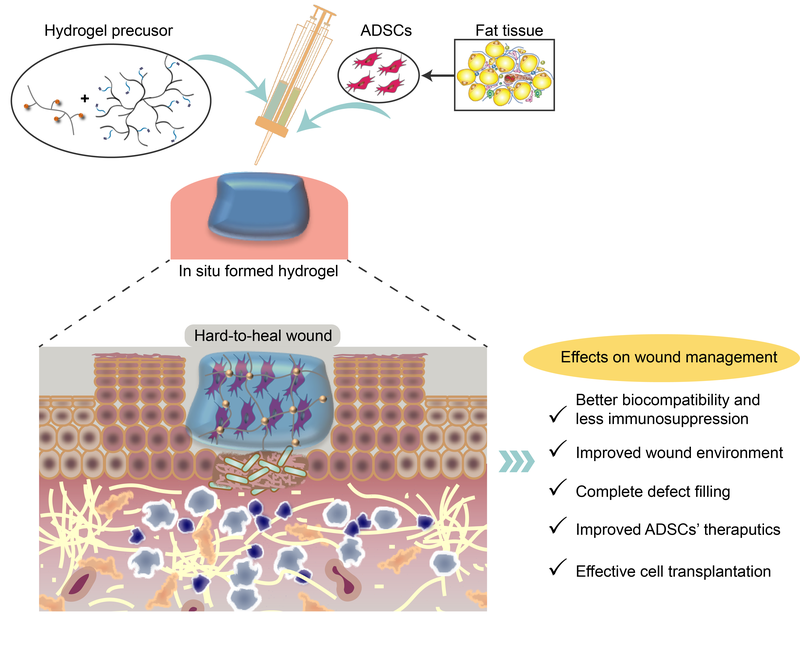 ROS scavenging hydrogel scaffold improves wound environment and protects transplanted cells.
. Dong, Y.; A, S.; Rodrigues, M.; Li, X.; Kwon, S. H.; Kosaric, N.; Khong, S.; Gao, Y.; Wang, W.; Gurtner, G. C. 'Injectable and Tunable Gelatin Hydrogels Enhance Stem Cell Retention and Improve Cutaneous Wound Healing'. ADVANCED FUNCTIONAL MATERIALS. 2017, 27(24), 1606619.
. Xu, Q.; A, S.; Gao, Y.; Guo, L.; Creagh-Flynn, J.; Zhou, D.; Greiser, U.; Dong, Y.; Wang, F.; Tai, H.; Liu, W.; Wang, W.; Wang, W. 'A Hybrid Injectable Hydrogel from Hyperbranched PEG Macromer as a Stem Cell Delivery and Retention Platform for Diabetic Wound Healing'. ACTA BIOMATERIALIA. 2018, 75, 63–74.
. Li, J.; Huang, Y.; Song, J.; Li, X.; Zhang, X.; Zhou, Z.; Chen, D.; Ma, P. X.; Peng, W.; Wang, W.; Zhou, G. 'Cartilage Regeneration Using Arthroscopic Flushing Fluid-Derived Mesenchymal Stem Cells Encapsulated in a One-Step Rapid Cross-Linked Hydrogel'. ACTA BIOMATERIALIA. 2018, 79, 202-215.
. Dong, Y.; Rodrigues, M.; Kwon, S. H.; Li, X.; A, S.; Brett, E. A.; Elvassore, N.; Wang, W.; Gurtner, G. C. 'Acceleration of Diabetic Wound Regeneration Using an In Situ-Formed Stem-Cell-Based Skin Substitute'. ADVANCED HEALTHCARE MATERIALS. 2018, 7(17), 1800432.
. Hassan, W.; Greiser, U.; Wang, W.* 'Role of Adipose derived Stem Cells in Wound Healing'. WOUND REPAIR AND REGENERATION. 2014, 22(3), 313-325.
. Dong, Y.; Hassan, W.; Kennedy, R.,; Greiser, U.; Pandit, A.; Garcia, Y.; Wang, W. 'Performance of an In-situ Formed Bioactive Hydrogel Dressing from a PEG-based Hyperbranched Multi-functional Copolymer'. ACTA BIOMATERIALIA. 2014, 10(5), 2076-2085.
. Xu, Q.; Guo, L.; A, S.; Gao, Y.; Zhou, D.; Greiser, U.; Creagh-Flynn, J.; Zhang, H.; Dong, Y.; Cutlar, L.; Wang, F.; Liu, W.; Wang, W.*; Wang, W.* 'Injectable Hyperbranched Poly(β-amino ester) Hydrogels with On-Demand Degradation Profile to Match Wound Healing Process'. CHEMICAL SCIENCE. 2018, 9, 2179-2187.
. Xu, Q.; Venet, M.; Wang, W.; Creagh-Flynn, J.; Wang, X.; Li, X.; Gao, Y.; Zhou, D.; Zeng, M.; Lara-Sáez, I.; A, S.*; Tai, H.; Wang, W.*; 'Versatile Hyperbranched Poly(β-hydrazide ester) Macromers as Injectable Antioxidative Hydrogels'. ACS APPLIED MATERIALS & INTERFACES. 2018, 10(46), 39494-39504. The closure and repair of wounds after traumatic or surgical injury is of significant clinical and research importance. While sutures remain the common wound closure technique, they have many disadvantages, such as penetration of surrounding tissue, fluid or air leakage, inflammatory reactions and not always technically possible. Moreover, the current available tissue adhesives cannot meet the requirements of sophisticated surgeries. One major limitation is difficult to balance the adhesive strength, the mechanical property and the responsive degradation rate. Consequently, synthetic polymeric and naturally derived adhesive materials have emerged as essential materials for wound management and repair because of their tunable chemical and physical properties, enabling them to adhere or stick to tissues. They also possess sufficient mechanical strength to stay intact and can be subsequently removed, provide complete wound occlusion, and act as a barrier to bacterial infection. There is significant potential for further development of this type of biomaterials to the next step towards the realization of clinical wound closure applications ultimately. Inspired by nature, our strategy is to design and synthesize tailored synthetic and naturally derived biopolymers for wound closure of different types of tissue (topical skin, sternal bone and internal soft tissue) with superior properties over the current tissue adhesive (Figure 1). To this end, utilizing our advanced RDRP platform, a variety of branched polymers (1-3) and functionalized ECM with different physical, chemical and mechanical properties have been synthesized. Branched polymers and functionalized ECM show great superiority in structure and performances, exhibiting the apparent advantages of low chain entanglements, low melt and solution viscosity, high solubility and a large number of terminal groups that are easy to be chemically modified (Figure 2). 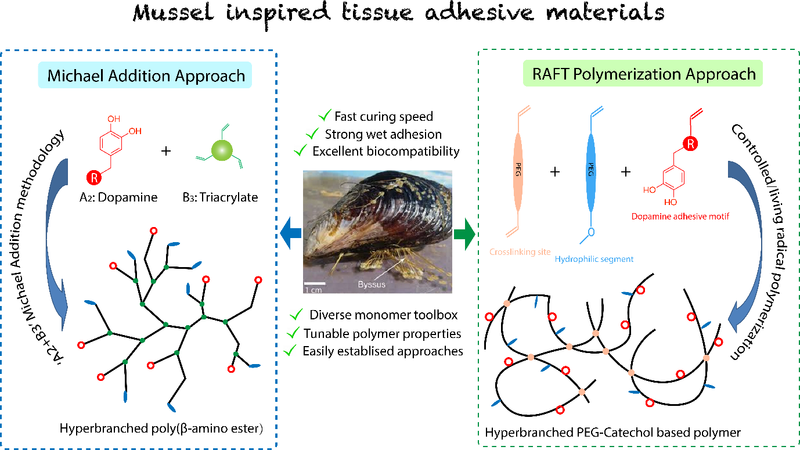 Taking these advantages into account, our newly developed materials are of great significance for designing and producing biomaterials as tissue adhesives.
. Zhang, H.; Bre, L.; Zhao, T.; Newland, B.; Da Costa, M.; Wang, W.* 'A biomimetic hyperbranched poly(amino ester)-based nanocomposite as a tunable bone adhesive for sternal closure'. JOURNAL OF MATERIALS CHEMISTRY B. 2014, 2, 4067-4071.
. Zhang, H.; Bré, L.; Zhao, T.; Zheng, Y.; Newland, B.; Wang, W.* 'Mussel-inspired hyperbranched poly(amino ester) polymer as strong wet tissue adhesive'. BIOMATERIALS. 2014, 35(2), 711-719.
. Zhang, H.; Zhao, T.; Newland, B.; Duffy, P.; Annaidh, A.; O'Cearbhaill, E.; Wang, W.* 'On-demand and Negative-thermo-swelling Tissue Adhesive Based on Highly Branched Ambivalent PEG–catechol Copolymers'. JOURNAL OF MATERIALS CHEMISTRY B. 2015, 3, 6420-6428.